Getting literature recommendations from Basil? Risky, very risky, I know, but I decided it was worth a shot. I assume a lot of people in the past few decades have come to this book after seeing the massively successful film, but I am not among them. 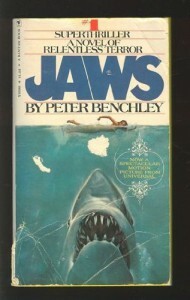 As remarkable as that sounds, yes, I am one of the few dozen people in the industrialized world who has not seen Jaws! I've caught bits and pieces of it on cable TV over the years, but I was never captivated enough to sit through it from start to finish. What I have seen, I don't remember, so I was coming to the novel a tabula rasa. When I finally picked up the book, I had a preconceived notion. I assumed the movie was a mindless action flick, the characters and their dialogue serving only as spaceholders between big explosions and gratuitous scenes of gore. I was pleasantly surprised that the book really wasn't like that at all, and as a consequence, I'm curious if the movie is. Now I'm not saying this isn't a page-turner, because it certainly is; but it's also a story about a small, East End town (being a native Long Islander myself, I appreciate the publicity), the social dynamic that exists there between the classes, and personal failings of individuals. It was a good effort, but not wholly well-executed. Other than the Chief Brody character, and to a lesser extent his wife, few of the (overwhelmingly) men that peopled the book had much dimension to them. Lastly, I'll say that I found it hysterical that a significant part of the book dealt with the husband-wife dynamic and how one of these spouses felt unfulfilled because they viewed themselves as from a socially superior caste than their counterpart. 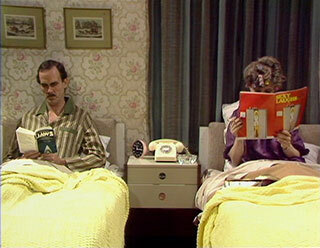 When I was watching Fawlty Towers, I assumed they had Basil reading thsi book because it was popular at the time. But now that I've read it and seen how prominent the class issue was, I can't believe the parallel between the character I'm describing from the book and Basil Fawlty's own middle-class haughtiness wasn't intentional.